Unique salvation-historical. Does the main point address a text that thrusts forward the unfolding plot of redemption in history? Individual Non-Christian. Does the main point have implications for the unbeliever’s thinking, behavior, or motivations? Public. Does the main point have implications for how we conduct ourselves in the public squares of commerce, politics, justice, etc . . . ? Christological. Does the main point have implications for how we think about Christ Himself? Individual Christian. 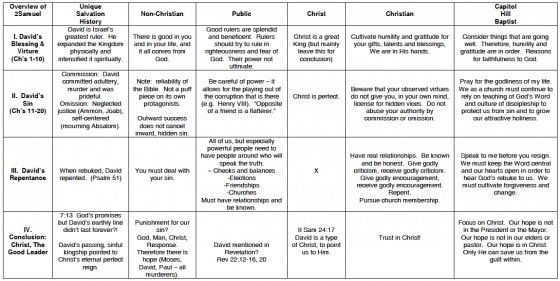 Does the main point have implications for my own persona discipleship to Christ? Local church. Does the main point have implications for how we conduct ourselves as an assembled congregation or in our corporate life together? To print out a blank grid in PDF, click on the image below. 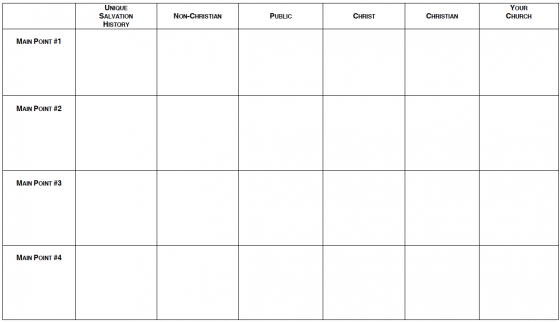 Following the blank grid, there’s one filled out from an overview of 2 Samuel.